Manage your product catalog online. Get organized and eliminate duplicate items. 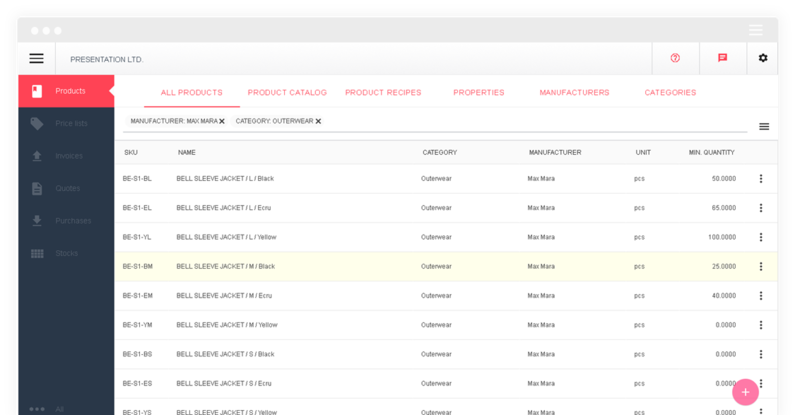 Find out how you can make your product catalog more organized and smarter using Backstore. Enforce unique SKU to avoid duplicate products and get a clear stock report. Quickly create different variants by color, size and other properties. Put together a new product using product recipes and get an assembly cost. Organize your products in a hierarchy and gain insight into sales performance for each category. Set minimal quantities for each product to be alarmed when it's time to make a new purchase. Create product series and set expiry dates for food, drugs and similar products. Quickly find products you have been looking for. Search by SKU, name, manufacturer, category and custom properties. Set the tax settings at category level for each country you do business in. All settings are inherited from top down. We never lock any of your data. You can always export the entire product catalogue to Excel file.